ALLEN, TX — The National Collegiate Wrestling Association (NCWA) hosted its National Championships tournament in Allen, TX this past weekend. 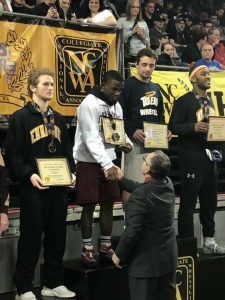 Thirty-eight men and twenty-three women from eleven Texas colleges and universities represented the NCWA Southwest Conference in the tournament, with two men and eleven women earning All-American honors. Ty’Rae Carter of Texas A&M led the way for the Conference at 149lbs. with an incredible second-place finish. Carter, a freshman engineering major, entered the tournament unseeded on one of the Conference’s five at-large bids, but compiled upset victories over the first, fourth, and fifth seeds on his path to the championship finals. Carter knocked off the fourth seed, Chad Cantrell of Liberty University, with a 12-9 decision in the Round of 32 on Thursday. He then met the fifth-seeded Nick Puliti of Temple in the quarterfinals, and dispatched him by a score of 4-1. In Friday night’s semi-finals, Carter pulled off the upset of the tournament against first-seeded Jay Sheppard of Emmanuel College, winning by a slim 4-3 decision. Carter sought still another upset in Saturday night’s championship finals against the University of Toledo’s Zach Blevins, seeded second. Carter immediately found himself in danger after Blevins secured a takedown to the back within the first thirty seconds of the match. Carter fought impressively to eventually get back to his belly and escape, but found himself in a six-point hole almost immediately, and with Blevins racking up one minute of riding time in the first period. Carter started the second period on the bottom, escaped, and shucked Blevins by for a takedown, closing the gap to 6-4 in favor of Blevins. The Toledo wrestler quickly recovered with a roll-through to a reversal, nearly putting Carter on his back again. Carter conceded the escape to start the third period. He continued to attack the legs, but could not break Blevins’s defense. For the match, Carter attempted eleven shots to Blevins’s two, but Blevins’s first-period six-point move set the margin of victory, with Carter falling by a decision, 10-4. This is the second time that Texas A&M head coach Mike Konetski has led one of his wrestlers to the NCWA National Championships finals. Carter was not the only Southwest Conference wrestler at the tournament to find success in the 149-pound weight class. The University of North Texas’s Scott Akers also took home All-American honors. UNT’s women’s program has had recent success on the national level, particularly with Avery Souders’s championship run in the 2017 NCWA National Championships. However, Akers is the first to earn All-American status for the UNT men’s wrestling program, led by head coach Andre Metzger. Akers won the Southwest Conference tournament two weeks ago, and entered the National Championships seeded sixth. He narrowly escaped a first-round upset with a 6-4 victory over Georgia’s John Cruz, but came back strong with an 11-0 major decision in the Round of 16 over TyShane Young of Gray’s Harbor College. Akers dropped his quarter-final match against third-seeded Martin Mitchell of UMBC, losing by pin-fall at 1:32. Moving into the Blood Round, Akers would have one last shot to secure All-American status. He was ready off the whistle, and grabbed the lead with a takedown at the twenty-one second mark against Tyler Everett from University of Maine. Akers was dominant on top, accruing 2:39 of riding time in just the first period. But Everett showed he could be equally dominant from the top position, and wound the riding time clock down to 1:10 before giving up a second period escape. The wrestlers started neutral in the third period, and Akers was quickly awarded one point on a technical violation as Everett figure-foured the head. Everett did not stop the attack though, scoring a takedown and erasing Akers’ riding time advantage before Akers was able to escape and successfully defend two more attacks to secure the 5-2 victory. Akers would go on to drop his next two bouts in the tournament, finishing in eighth-place. The NCWA awarded the Southwest Conference thirty-eight bids to this year’s National Championships. The top-three finishers in each weight class at the Southwest Conference tournament automatically advanced to compete in the National Championships, while the Conference Committee awarded five at-large berths. A full listing of the men’s qualifiers is listed below. Full results and archived video of each match can be found on FloArena.